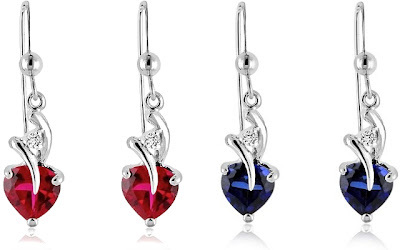 These 3.00 Carat tw Ruby & White Sapphire Heart Drop Earrings in Sterling Silver are currently selling for just $29.95 on Amazon.com! You will be saving 75% off the listed price of $120.00 with this jewelry deal. You also get the 3.00 Carat tw Blue & White Sapphire Heart Drop Earrings in Sterling Silver for the same deal! These heart earrings would make perfect Valentine's Day gifts whether you choose the ruby or the blue sapphire.